HP's Windows Mixed Reality Headset was bulky and plasticky, and a far-cry from the more comfortable designs of devices like the Oculus Go or Rift. But now the company is back with a new headset that has a less generic name, the HP Reverb. The new headset sports a slightly larger field of view at 114 degrees, compared to the original's 105-degree field of view. It's also only 1.1 pounds, less than the 1.84 pounds of the original. The resolution gets a bump up from the previous headset's 1440 x 1440, coming in at 2160 x 2160. Another difference: It's gotten rid of the adjustment dial back for a top strap, making it much easier to put it on and off. It's also powered by Windows Mixed Reality, has six degrees of freedom and inside-out tracking. There's support for video passthrough too, so you can see the world from inside your headset. Naturally, it supports Microsoft's Bluetooth-enabled motion controllers. There are two versions of the Reverb, consumer and professional. 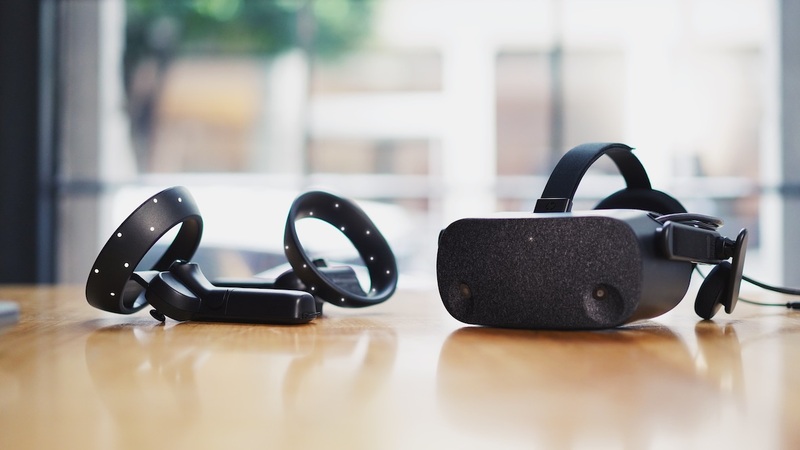 HP says it consulted with business customers on what they wanted from a new Windows Mixed Reality headset and just made that for the professional model. That version also comes with some more goodies. You'll get a 0.6m headset cable for PC backpacks and a washable fabric face cushion to make things comfortable. Otherwise, the two devices are identical. They both come with two motion controllers, a 3.5m headset cable, and one DisplayPort to mini-DisplayPort adapter. The Pro version will cost you $649 while the consumer edition will cost $599. Both will ship out in late April.